Chickens like to scratch in the dirt, leaf litter and other areas to look for bugs to eat. To help them exercise their natural instincts, we decided to build a sandbox for the chickens near their coop. 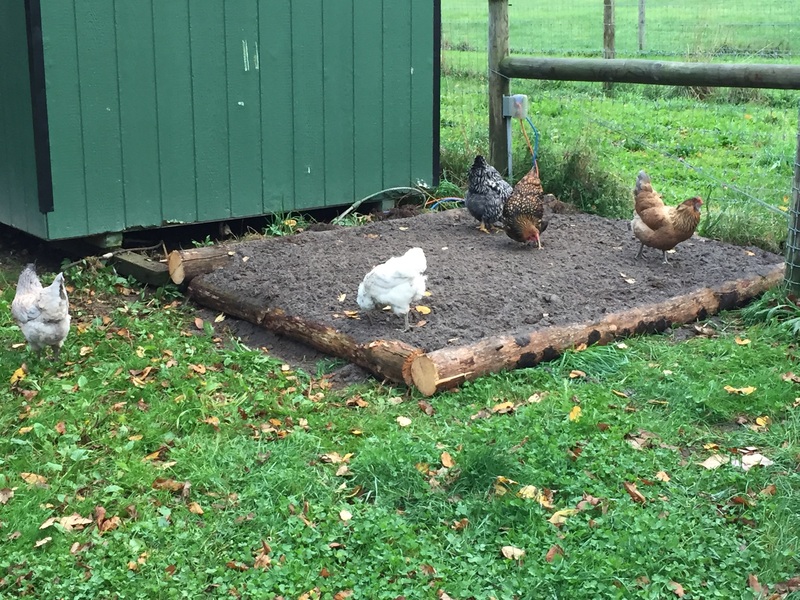 Here is a video of the chickens enjoying their sandbox for the first time last fall. You can see them scratching at the surface and then looking for anything that might be edible. The construction was very simple and cheap. We used 4 logs from downed trees on our property. We just placed them into a rectangle. Then, for the sand to fill the sandbox, we used excess sand that was kicked up from the drilling rig when it drilled the holes for our geothermal heating system. I used the loader on the tractor to move the sand. It cleaned up the excess sand in the yard and helped the chickens at the same time. Occasionally we rake the top layer if the sand becomes too packed. We also throw some seeds or other food on top of the sandbox to re-generate interest in the sand from the chickens. Chickens in the Sandbox in the distance. Last winter was very mild overall – we only received around half of the typical snowfall totals (just over 60 inches where normal is over 120 inches). This winter started off on a different note. First big snowstorm of winter 2016-2017. The first big storm came right before Thanksgiving – we received almost 30 inches in the first big snowstorm alone. Here is a picture measuring the snowfall total during the first night of the storm – it was close to 20 inches the first night and near 30 inches when it stopped snowing.